For the second week in succession, Larne rattled in four goals - this time overwhelming Lisburn Distillery. To add to their woes the home side finished the game with nine men and had their manager, Tommy Kincaid, sent to the stands. 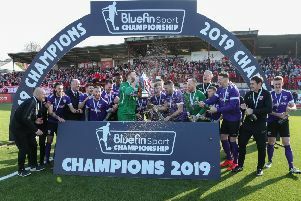 Ciaran Murray made it five goals in two games with a brace, while Darren Stuart scored his first Larne goal with Stuart McMullan completing the rout. Larne took the lead on 20 minutes when Murray pounced on poor defending to walk the ball into the net. The Reds continued to dominate and doubled their lead on the half-hour. This time Murray was the provider. His driven corner from the left was met with a bullet header by McMullan which gave Whites keeper McBride no chance. Murray made the game safe 17 minutes from time. His initial shot was blocked but he didn’t give up sending a cracking volley high into the net. Man of the Match Murray then set up the fourth playing in Stuart for a clinical finish. The home side had Stuart Thompson and substitute Joe McDonnell red-carded in the final five minutes. Distillery: McBride, Kirgan, Thompson, Young, Nixon, Kopyt, McIlhagga, O’Connor, Doyle, Smith, Jones. Subs: McDonnell, Southam, Bingham, Kane.